Dianne Burnett at the NYC book launch. Photo courtesy of Lori Bizzoco. An hour before her book launch, Dianne Burnett is nothing but smiles as she walks into the room at the Kimberly Hotel in New York City to meet us for an interview. A clearly happy Burnett speaks with ease about her new book, her former marriage and the exciting ventures that lay ahead. Dianne released her memoir, The Road to Reality: Voted Off the Island!…My Journey as a Real-Life Survivor last Tuesday. Her ex-husband Mark Burnett has been the mastermind behind some of televisions greatest reality shows, including “The Apprentice,” ‘The Voice’ and Survivor,’ one of the most successful programs of all time. But this Reality King didn’t get there alone, or at least not according to Dianne and her tell-all book. Nine years after their divorce, the ex-wife of the the TV powerhouse is stepping out of the shadows to tell her side of the story. But, if you are looking for her to bash and destroy her ex, you won’t find it here. After reading the book and then sitting there with Burnett, the burning question on our mind was why was the book getting so much negative press from Mark. Burnett nodded and admitted that the release of the book has created a rift between the typically amicable exes. “I don’t really know him that well right now,” she explains. “Just last month we were all together at Nobu for my son’s birthday, but since the book, it’s been a little bit…different.” However, they both try to keep a brave face for their two children, Cameron, 15 and James, 19. The author even says that part of the reason for writing this book was so that her children would know the truth. Keeping up the positive vibe, Burnett is also launching a new drink called Mulberry Love, made with fruits, coconut water and antioxidants, which can help prevent disease. She describes the drink as not only healthy but “very yummy.” It hits store shelves later this year. 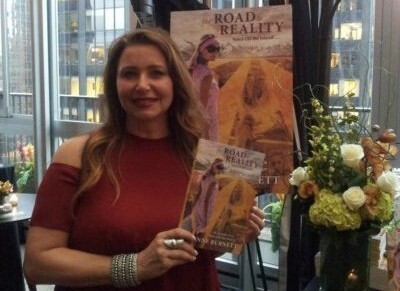 Burnett’s new book, “The Road to Reality: Voted Off the Island!…My Journey as a Real-Life Survivor,” is in stores and online at Amazon. To learn more about Burnett, you can follow her on Twitter at @DianneBurnett.